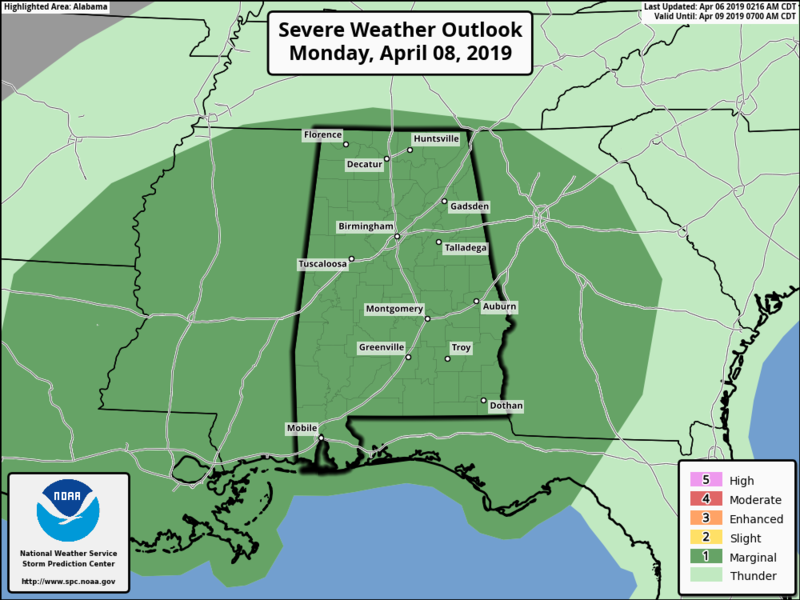 SEVERE WEATHER OUTLOOK FOR THE WEEKEND AND MONDAY: For today, nearly all of Alabama has been placed in a marginal risk for severe storms, mainly for isolated damaging wind gusts up to 60 mph and hail up to 1 inch in diameter. On Sunday, we have a slight risk for locations in northwestern Alabama, mainly from Hackleburg (Marion County) to Vernon (Lamar County) and points west. A marginal risk extends out from that to a line from Snead (Blount County) to Birmingham to Marion (Perry County). And on Monday, all of Alabama has been placed in a marginal risk for severe storms. TODAY: We have troughing out in the west with a decent ridge over the southeast that is pushing warm, moist air up from the south, which will lead to instability during the heating of the day. Along with that, we’ll have a warm front that will be pushing northward through the state today. With highs topping out in the upper 70s to the lower 80s and dewpoints in the mid to upper 60s by the late afternoon, we have the potential for some scattered thunderstorms to develop and persist through the evening. A few of these storms have the potential to become strong to marginally severe, with isolated damaging winds and quarter-sized hail as the threats. 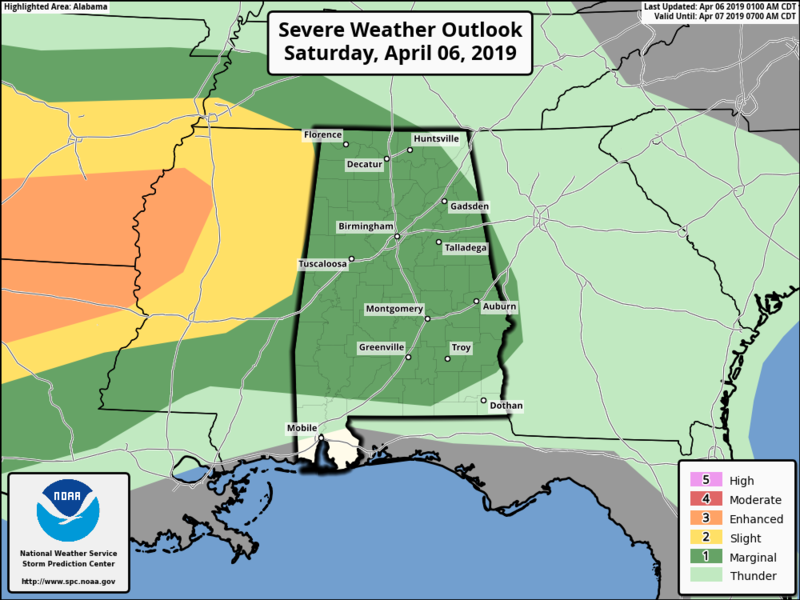 The window for the potential of strong to severe storms will be from 1 p.m. to 7 p.m. for the southern half of the state, and from 5 p.m. to midnight for the northern half. Showers and thunderstorms will remain likely overnight with lows in the lower to mid-60s. 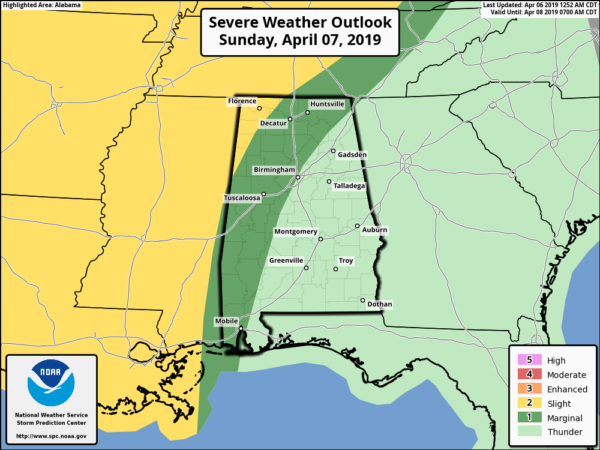 SUNDAY: The daytime Sunday looks to be dry for much of Alabama; any isolated to scattered afternoon thunderstorm activity will be limited to the extreme western locations and in the southeastern corner. We’ll have partly to mostly cloudy skies with highs reaching the upper 70s to the lower 80s. Sunday night, the troughing moves closer to the state and a low will be stationed over eastern Texas, which will send thunderstorms into Alabama through the late-night and overnight hours. We’ll have the potential for strong to severe storms for the western half of Alabama, with isolated damaging wind gusts up to 60 mph as the main threat. Lows will be in the lower to mid-60s. MONDAY: The low creeps even closer to the state on Monday, continuing to keep us in an unstable air mass with showers and thunderstorms likely throughout the day. Some of the storms could be strong to marginally severe, with isolated damaging wind gusts up to 60 mph being the main threat. Highs will be cooler with the cloud cover and rain, reaching only the lower to mid-70s. TUESDAY: The low finally makes it into the southwestern parts of the state on Tuesday, which will keep us continuing with the chance of scattered showers and thunderstorms, but at this point no severe weather is expected. Highs will start to rebound and will be back up in the mid to upper 70s. WEDNESDAY: Wednesday will be a sunny, warm day with afternoon highs topping out in the lower to mid-80s. THURSDAY: Much of the day will be nice and warm, but an impulse moving through the area could bring a squall line of storms during the evening and overnight. At this point, warm air aloft looks to provide a cap on the atmosphere, which may limit that activity. We’ll have a better idea as we get closer. Highs reach the upper 70s to the mid-80s. FRIDAY: Much cooler weather can be expected on Friday with clearing skies. Afternoon highs will be in the upper 60s to the mid-70s.